If you were selected to attend the Southern Arizona Research, Science and Engineering Fair, you are already a winner! Your school administrators considers your project of such quality they want you to represent them. Your project will now go on to compete with others from around Southern Arizona. Check out what awards and prizes you can win in the “What Can I Win?” section. There are some things that you need to know before you come to SARSEF, so read on and find out how you can increase your chances or being recognized for your great research! If you register for SARSEF, you are also granting us permission to send your information to higher competitions if you win, such as Intel ISEF, ISWEEEP, AZSEF, and the Arizona Governor’s Celebration of Innovation, all of which may earn you thousands of dollars and scholarships! Make sure that your project gets registered by February 20, 2019 so you can compete! Check with your school or teacher to make sure that this is done. On March 6, make sure someone brings your project to the Tucson Convention Center for set up anytime between noon and 8 p.m. Your log book should go with your board. You are welcome to set up your own board after school as well. Judging will take place on March 7. On March 8, be sure to bring friends and family to “Future Innovators Night.” The event will run 5:30-8 p.m. ALL students and parents are welcomed and encouraged to attend! There will be lots of interactive displays and demonstrations that night. If you are an elementary school student, and your project was awarded a prize, the awards ceremony will be March 9. IMPORTANT: Don’t forget to return and pick up your project on March 9 before 9pm. Any projects not removed by that time will be thrown away to make room for upcoming events. The categories listed below are those used at SARSEF and they match those used at the Intel ISEF. Use the list of category links below to go directly to the one you are interested in, or browse through the entire list of available categories. Many projects could easily fit into more than one category. It is your decision to choose the category that most accurately describes your project. Your project must have been one of the best to be chosen. Now, you will want to thank all of those who believe in you by representing them as best you can. Take some time now to make sure your poster/board is exactly how you want it to be and clearly communicates the criteria below. Impressing judges with your science and, to a much lesser extent, with your project board is important. Yes, a colorful project board neatly laid out with beautiful photos will draw attention to it, so working towards that goal is good. However, once a judge starts reviewing your work he/she usually starts by looking at your problem statement/hypothesis, then at your conclusion, and after reviewing those two they review your abstract, presentation, data analysis, and try to determine how creative and curious you really were. Judges generally follow the point system laid out in the criteria listed below, so now is the time to make sure that you clearly show evidence of each of your steps on your board. Interviews are required at the high school level. Practice with anyone and everyone before the judging day. Have your family and friends ask you questions even if (or especially if) they do not know anything about your project. You should be able to explain it on a variety of levels. Think of every question you don’t want to be asked — and prepare an answer for it anyway. Practice an “elevator speech.” This is a less-than-60-second explanation of your project — about as long to get from one floor to another in an elevator with a stranger who asks what your project was about. Dress professionally. Wear business professional clothes for the interview. You will be glad you did. Everyone dresses up as best they can. For men, this is usually a dress shirt at a minimum, often with a tie, and if possible, a suit. For women, a business suit is appropriate — however a dress, and if possible, with a jacket is fine as well. Make sure that your school understands that you will be expected to participate in the International Science and Engineering Fair if you are one of our top six winners at SARSEF. This will be held in Los Angeles from May 14-23. All expenses for you and your teacher will be paid by us! However, your school district and school should be aware that they will need to release you and your teacher to attend, should you win. The following evaluation criteria will be used for judging at SARSEF. It has been updated to reflect the latest scientific thinking and parallels the criteria used to judge International Science and Engineering Fair projects. Awards’ judging is conducted using a 100-point scale with points assigned to the research question, design and methodology, execution, creativity and presentation. Each section includes key items to consider for evaluation. Students are encouraged to design their posters in a clear and informative manner to allow thorough evaluation. Judges should take into consideration the grade level when scoring. Examine the student notebook and, if present, any special forms if SRC permission is required. Data is important in research. The more data you have, and the more sophisticated the analysis, the more accurate your science is. If your data shows trends, use good analysis and graphically represent those trends. Be careful about making predictions out of the scope of your project — that is, interpreting a cause and effect that you cannot statistically support with your data. Whenever possible, report your conclusions using math skills. Consult your science and math teachers for assistance. Your abstract can do a lot to influence a judge. Good use of the written language is a key part of a scientist or engineer’s profession. Writing a good abstract will impress, especially if backed up by good data collection and analysis. Abstracts should be no longer than 250 words. IMPORTANT: Do not include your abstract on your poster or board. If you were selected to attend ISEF it will not be allowed to be on your board, since it has to be an official one with a gold stamp of approval. Instead, we recommend that you lay it in front of your project or purchase a clear stand, and with some kind of backing for that page, if possible. The following evaluation criteria will be used for judging at the Intel ISEF and SARSEF. Awards’ judging is conducted using a 100-point scale with points assigned to the research question, design and methodology, execution, creativity, and presentation. Following please find information that will assist you in evaluating and scoring in each of these categories. Each section includes key items to consider for evaluation both before and after the interview. Students are encouraged to design their posters in a clear and informative manner to allow pre‐interview evaluation and to enable the interview to become an in-depth discussion. Judges should examine the student notebook and, if present, any special forms such as Form 1C (Regulated Research Institution/Industrial Setting) and Form 2 (Qualified Scientist). Considerable emphasis is placed on two areas: Creativity and Presentation, especially the Interview section. If the project was done at a research or industrial facility, the judge should determine the degree of independence of the finalist in conducting the project, which is documented on Form 1C and Form 2. If the project was completed at home or in a school laboratory, the judge should determine if the finalist received any mentoring or professional guidance. If the project is a multi‐year effort, the interview should focus ONLY on the current year’s work. Judges should review the project’s abstract and Form 7 (Intel ISEF Continuation Projects) to clarify what progress was completed this year. AzSEF is the State Fair for Arizona. Grades 5-12 students can qualify to enter by placing first at SARSEF. Conrad Foundation’s Spirit of Innovation Awards: This competition challenges student teams to solve real-world problems in the areas of clean energy, aerospace exploration, and cyber security. For students age 13-18. Winning team is awarded $5,000 to continue product development. Spirit of Innovation Awards are sponsored, in part, by Lockheed Martin Corporation. Davidson Fellows Scholarship Program: This program aims to recognize exceptional students and support them in the fulfillment of their potential. It includes categories of science, mathematics, and technology, among others. The top prize is $50,000. Discovery Channel Young Scientist Challenge (DYSC): For students in Grades 5-8. Ten finalists will receive $1,000 and an all-expenses-paid trip to St. Paul, Minn. for the competition finals. The first-place winner will receive $25,000. 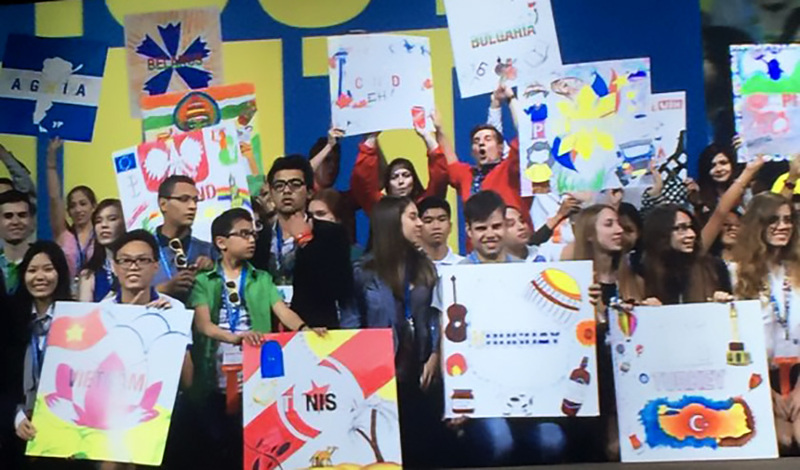 Intel International Science and Engineering Fair (ISEF): For high school students, who must first qualify at an affiliated fair. Top prize is a $75,000 scholarship. Six high school projects and two to three middle school projects are selected each year at SARSEF to attend this global competition. I-SWEEEP http://www.isweeep.org/: Two students from SARSEF are chosen to advance to this global competition in Houston, Texas each year. Siemens Westinghouse Competition in Math, Science and Technology: A competition for high school students. Top prize is a $100,000 scholarship. Team America Rocketry Challenge (TARC): The world’s largest model rocket contest, accepts teams of students in grades 7-12 from any U.S. school or non-profit youth organization. The Junior Science and Humanities Symposia (JSHS): This program invites high school students in Grades 9-12 to conduct an original research investigation in the fields of science, engineering or mathematics, and to participate in a regional symposium sponsored by universities or other academic institutions. Regional winners proceed to a national competition. Young Naturalist Awards: This program, sponsored by the American Museum of Natural History and sponsored by Alcoa Corporation, is a research-based essay contest for students in Grades 7-12 to promote participation and communication in science.